One of my favorite things about visiting my sister and brother-in-law in Portland, Oregon, (besides seeing them and my adorable new nephew!!) is the food scene. I have had some of my best meals in this great town - seriously, even the airport has such a great restaurant - The Country Cat - that I go back to the airport early JUST so I can eat there. Plus, I am lucky to have foodies in my family who enjoy taking me to great places! The first time I went out there I got to experience something for the first time - ramen. Confession... I didn't have my first real bowl of ramen until I was 40. It's not because I didn't want to try it, we just don't have any ramen places around here! The next summer when I visited we went to the Pine Street Market, a very cool food hall. Walking around this place is like a trip to heaven for a foodie. Nine of the city's best chefs and restaurants all in one place! How do you decide what to eat? I went with ramen, as well as some pork buns from another spot, and once again, my meal in the great PDX did not disappoint. 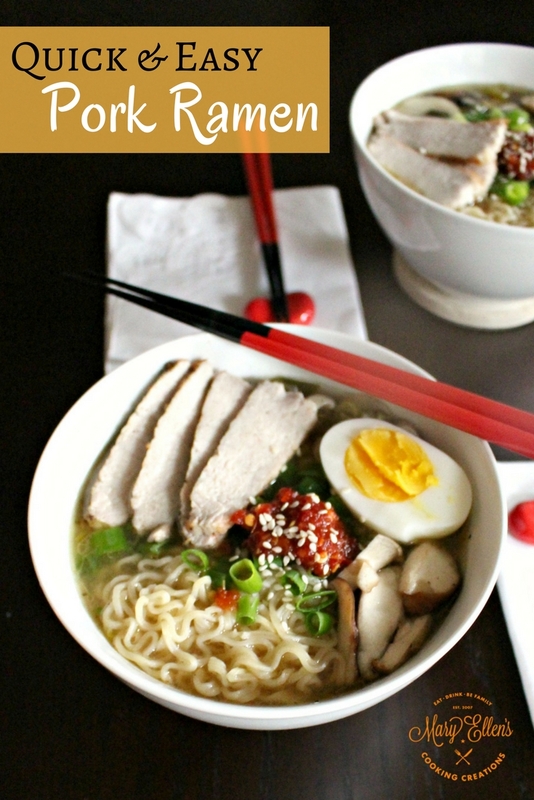 Rich, salty broth with curly noodles, scallions, spinach and thinly sliced pork. This soup IS a meal. 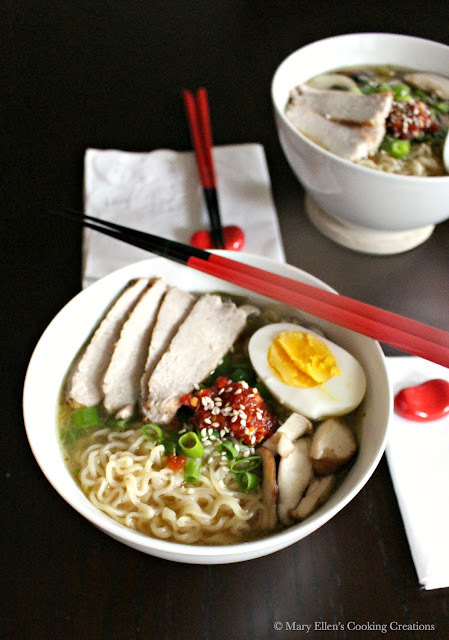 When I returned home I was craving ramen so badly that I had to try to recreate it. I thought back to the few times I had ramen and just went based on my memory of the flavors and ingredients. I made a chicken stock based broth with soy sauce, rice vinegar, and a few other ingredients. We filled our bowls with mushrooms, scallions, thinly sliced grilled pork, noodles, and an egg. Craving satisfied! Note: you can sub any protein for the pork. The last time I made it I used crispy, pan seared tofu. You could also use chicken, beef, shrimp, mussels, clams, etc - really anything you like! Experiment with different flavors and ingredients, too - add a dash of fish sauce, dried kelp, bonito flakes, grated carrots, miso paste, sprouts, or oyster sauce. * I season the pork chop with salt and pepper and grill it to 140 degrees; let rest 5 minutes before slicing. Add the broth, soy sauce, rice wine vinegar, sesame oil, mirin and green onion stems. Bring to a steady simmer and then reduce to a low simmer for 15 minutes. 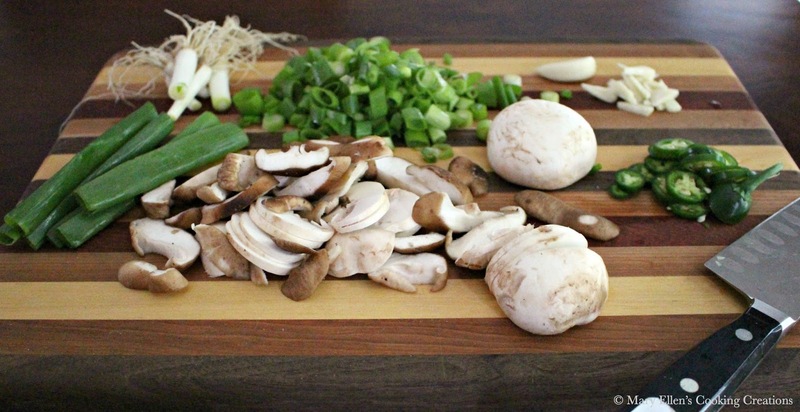 Remove the green onion stems and add the mushrooms. Let simmer 3 minutes and remove. If using greens, add them to the pot for one minute before you are ready to serve and remove. To plate: Put noodles, chopped green onions, greens, mushrooms and sliced pork in a bowl. 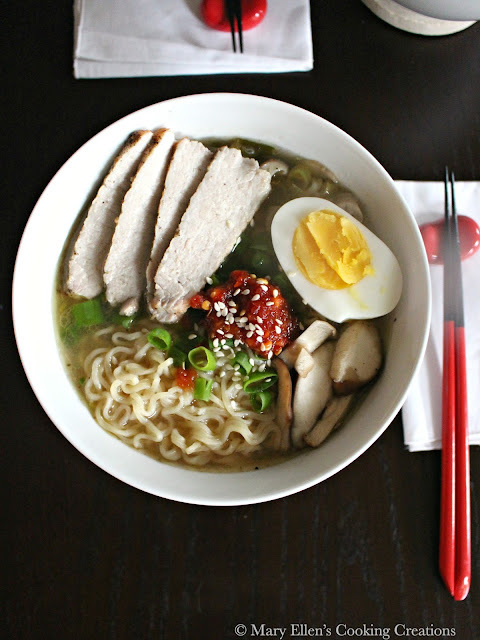 Pour broth on top and garnish with Sambal and an egg. This may just be the perfect Sunday dinner. 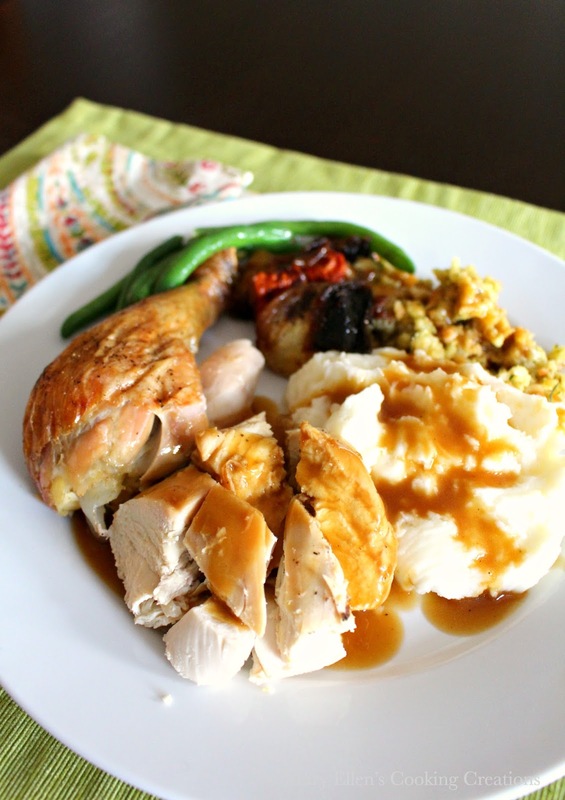 Juicy, tender chicken with homemade gravy and a plate reminiscent of Thanksgiving - mashed potatoes, veggies and stuffing. Roasting a chicken can seem intimidating - there are so many decisions. Brine or no? Stuff or not? What to season it with? Roast in a bag or not? And how to make gravy without lumps? I am going to take you through it step by step, and I'll make all the decisions for you. Honestly, it's easy. 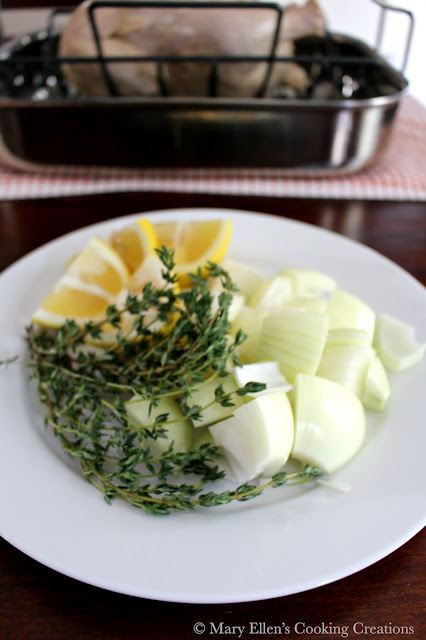 As long as you plan ahead so you have enough time to make and cool your brine, the steps are really simple. In this post I share details of each step with pictures, but just so you don't get overwhelmed, here is a simple, sample timeline. At the end of this post I'll give you easy to read, step by step instructions. Based on Sunday Dinner, adjust as needed: - Friday night: make and chill the brine - Saturday morning: add the chicken to the brine - Saturday night: remove the chicken from the brine and dry it in the fridge overnight - Sunday, 4 hours before you plan on eating: season and stuff the bird, truss and cook. So yes, I did decide to brine for the first time ever and now I will ALWAYS brine! Why? 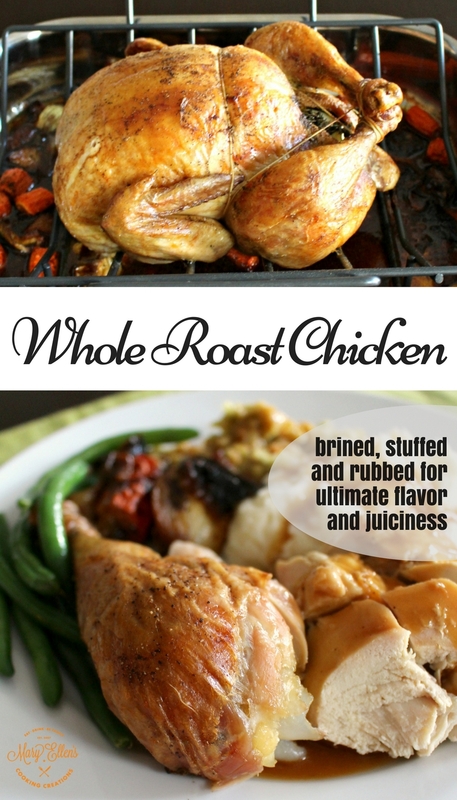 The skin was crispier, the chicken was juicier, and the overall flavor was out of this world. (note - if you buy a Kosher chicken it has already been brined). I did a lot of research on brines before making my own, and I decided to go with the advice of Chef Daniel Boulud and use a boiled brine that you chill as well as the drying method. If he can charge $75 a plate for his brined chicken, I'm sure his method has to produce some darn good chicken. Basically you bring your water and salt mixture to a boil (1 c salt to 1 gallon water). Adding sugar and other spices/herbs is optional, but I recommend doing it to maximize the flavors the brine will add. Once boiled, it is important to completely cool your brine. Putting your chicken into a warm bath to sit for 12 hours will just breed bacteria. So give yourself the time and completely chill the brine (use my timeline above). On Sunday morning it was time to finish prepping the chicken by adding more flavor. I always stuff my turkey with herbs and garlic, so it was a no brainer to do it with the chicken, too. I chose fresh thyme, chunks of lemon, onions and garlic. I often add sage and rosemary, too. Flavoring the skin and meat is important too. Make a mixture of butter (or oil), garlic, herbs, salt, and pepper. Use your fingers to gently lift the skin so you can season the meat. Be generous with it! You'll also want to season the skin. The final step is trussing the chicken, and I really like this tutorial. A woman behind the butcher's counter at the supermarket tried to tell me that you only need to tie the legs together, but following this tutorial helps to keep everything tucked in nice and tight. 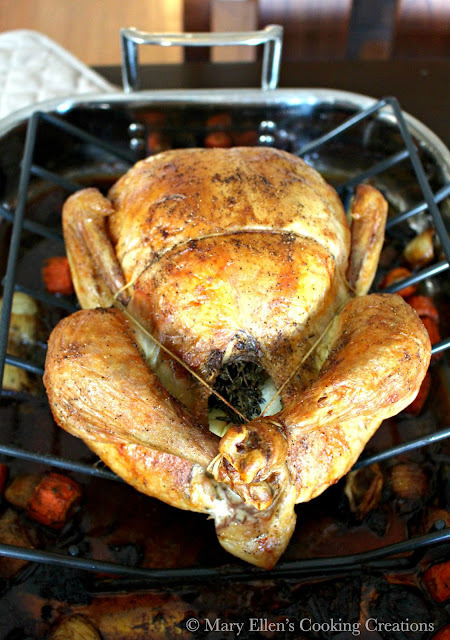 Put that bird on a roasting rack in a roasting pan that has been layered with carrots and onions. Feel free to add celery, garlic, or any other aromatics that you like. This is what is going to help flavor your gravy. If you don't plan on making mashed potatoes, throw some potato chunks in there too for amazing roasted potatoes. I like the high heat method of cooking chicken to get golden brown, crispy skin. Start your bird on 425 degrees F for 15 minutes, and then lower it to 350 degrees for the remainder. Plan on 20 minutes per pound. To summarize all of that, here is a timeline based on Sunday Dinner: - Friday night: make and chill the brine - Saturday morning: add the chicken to the brine - Saturday night: remove the chicken from the brine and dry it in the fridge overnight - Sunday, 4 hours before you plan on eating: season and stuff the bird, truss and cook. Look at this beauty!!! Is that a perfect chicken or what?? When you take the chicken out of the oven, you'll want to let it rest for at least 20 minutes before carving. 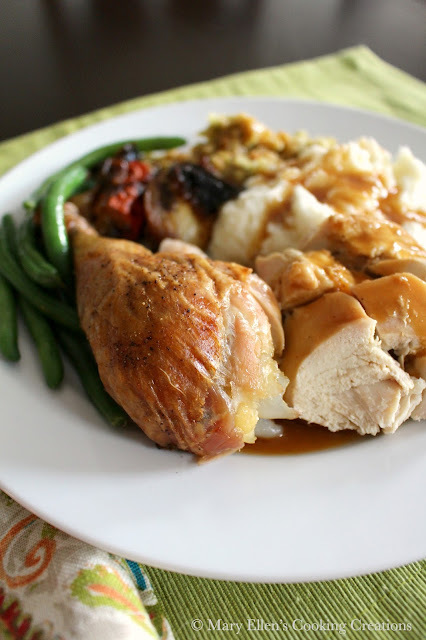 In that time you can make the perfect gravy - I share my recipe below which is a spin on my husband's recipe from his mom. Creamy, lump-free and perfect every time! Gorgeous. Mouth watering. The perfect Sunday meal. In a pot large enough to hold your chicken, combine the water, salt and sugar and stir until the salt and sugar have dissolved. Add the rest of the ingredients and bring to a boil. Let cool to room temperature and then cover and transfer to your fridge to chill overnight. 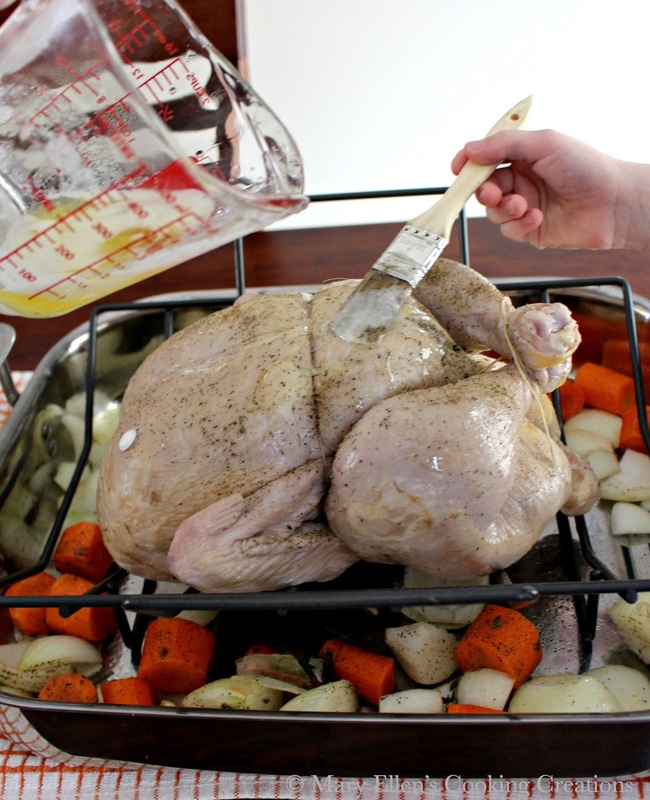 24 - 30 hours before your planned dinner, add the chicken to the brine. Keep in the fridge for 12-16 hours. Remove the chicken from the brine and pat it dry. Transfer to a large plate and place in the fridge, uncovered, for 12 hours. Put all of the above ingredients in the cavity of the bird. Combine the above ingredients. 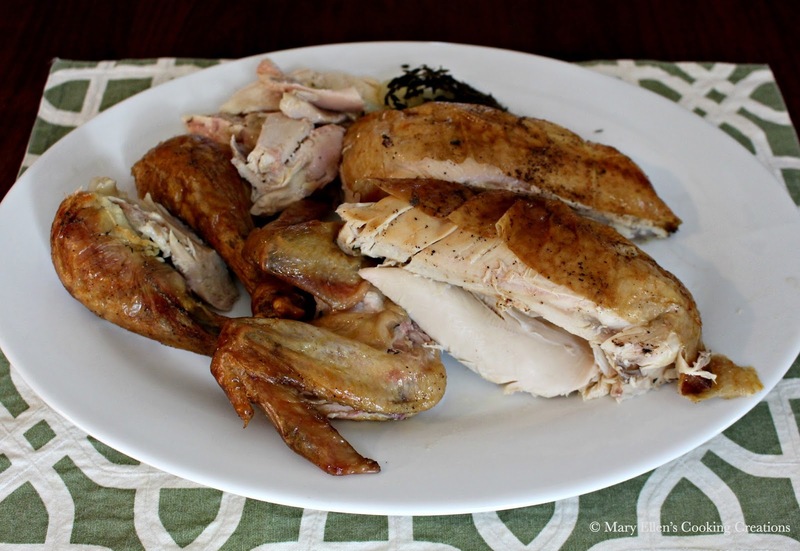 Gently lift the chicken's skin and apply the mixture directly to the flesh of the breasts. Additionally, brush your bird with olive oil and season with salt and pepper. Place a long piece kitchen twine across the breast and using both hands, flip the chicken over. Using your right hand only, wrap the twine around the smallest part of the drumstick two times (I'd call it the ankle :). Repeat with the left side. Tie the twine tightly so the legs close over the cavity. Now we're all trussed up with somewhere to go! Other optional ingredients: cloves of garlic, celery, potatoes - all roughly chopped. Preheat your oven to 425 degrees. 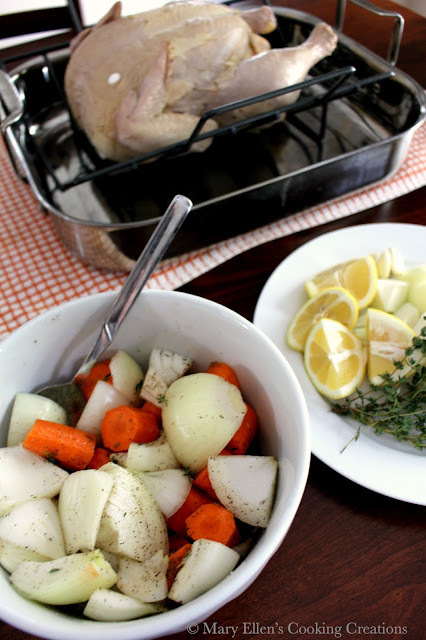 Toss the veggies with olive oil, salt and pepper and place in the bottom of your roasting pan. 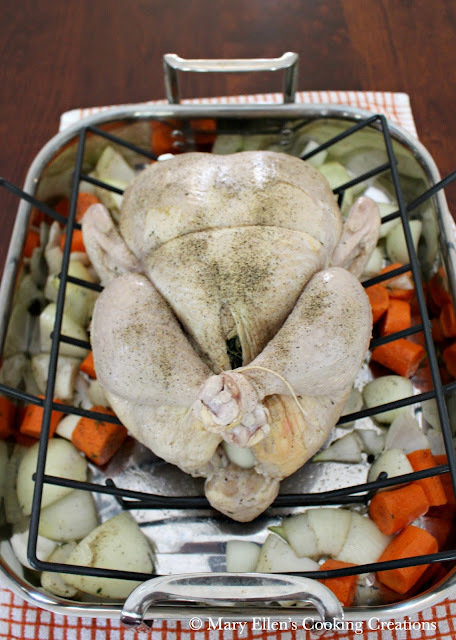 Place the chicken on a rack in the roasting pan. Place in the oven for 15 minutes. Lower the heat to 350 and cook 20 minutes per pound, until the internal temperature reaches 180 (breast) and 190 (thigh). Another way to test is to cut between the leg and the thigh and see if the juices run clear. Transfer the chicken to a cutting board (make sure it has a well, the chicken will leak!) and let rest for 20 minutes before carving. Using a slotted spoon, transfer the veggies to a serving bowl. Place your flour in a bowl leaving a well in the center. Slowly add 1 c of the liquid, whisking as you add. 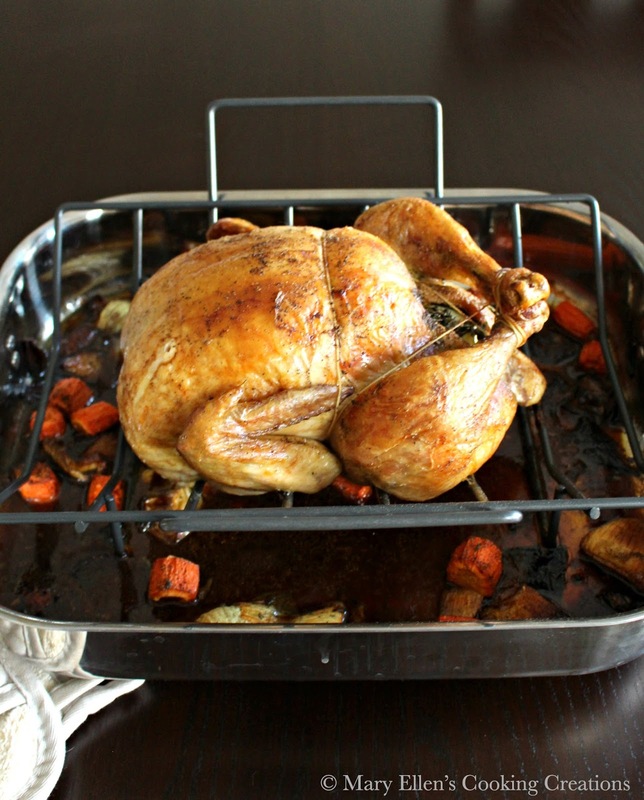 Place your roasting pan on the stove over medium heat. Add the 2 Tbsp of liquid, whisking it around the pan as you scrape up all the good brown bits. Slowly add the flour/liquid mixture - just a bit at a time - whisking constantly. Continue adding until you have the consistency you want. Season with salt and pepper, if needed. If it is too thick, add more liquid. If it is too thin, make another flour/liquid mixture and continue to add it until you have the gravy you desire.